In a much-awaited move, UEC-Saturn of Russia and Safran Aircraft Engines of France have signed a framework agreement regarding the development of a re-engined version of the Beriev Be-200 fire-fighting aircraft, using the PowerJet SaM146 engine, a turbofan developed and produced by the two aero-engine manufacturers through PowerJet, their 50/50 joint company. The agreement was signed by Olivier Andries, chief executive officer of Safran Aircraft Engines, and Alexander Artyukhov, director general of UEC, in a ceremony attended by Denis Manturov, Russia’s Minister of Industry and Trade and which was held within the scope of the high profile meeting between the French and Russian presidents, Emmanuel Macron and Vladimir Putin, at the St Petersburg International Economic Forum at the end of last week. 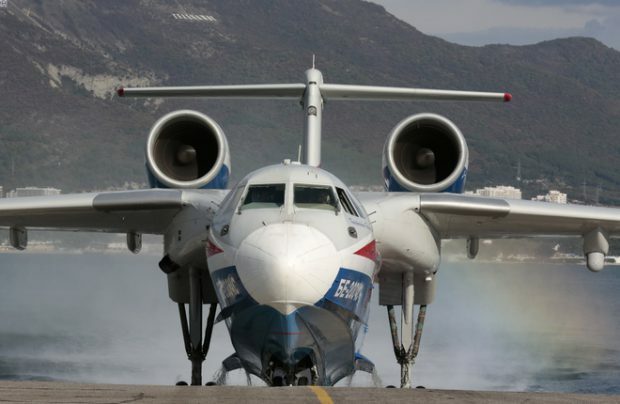 The Beriev Be-200 is a multi-role amphibious aircraft, with specialist capabilities which include maritime surveillance, wildfire-fighting, passenger transport and humanitarian relief. The Be-200 is the first aircraft of this type to be fitted with two jet engines located over the wings to reduce the risks of water projection. The partnership is also a new opportunity to develop further synergies with Safran Aircraft Engines, points out Alexander Artyukhov. “Along with our French partner we have defined a very clear road map, allowing us to start the development of a new version of the SaM146 that will meet the requirements of the Beriev-200,” he adds. The SaM146 version currently in operation powers the Russian-made Sukhoi Superjet 100 (SSJ100) regional jet and, as of May 2018, had logged more than 875,000 flight-hours. The upgrade includes a new nacelle, an over-the-wing mounted engine pylon and a significant update of the FADEC software. Not surprisingly, there is an extensive research and development (R&D) process required to satisfy the programme, and a roadmap has been outlined to streamline certification of the re-engined Be-200 and facilitate its entry into service by Q3 2020. The programme includes assembly of three engine prototypes. Be-200 will be powered by SaM146-1S18, currently used for the long-range (LR) variant of the SSJ100 and for the high-and-hot SSJ100B-100 version. These engines feature a five per cent thrust advantage over the base variant, to 7,332 kg. The Be-200 currently uses the 7,650 kg D-436TP engines produced by Ukrainian engine-maker Motor Sich, but reports quoting Russia’s Industry minister Oleg Bocharov suggest that the Ukrainian authorities have barred the engine producer from delivering additional D-436-family engines (which are also installed on Antonov An-148 regional jets) to Russia. Safran Aircraft Engines and UEC-Saturn inaugurated their partnership in 1996, when the Russian engine-maker began to produce parts for the CFM56. In 2004 the two partners created PowerJet, a 50/50 joint company, to develop and produce the SaM146 propulsion system for the Sukhoi Superjet 100 regional jet. This engine started revenue service in 2011 and has since logged more than 875,000 flight-hours for about 15 operators worldwide.